I know, leaves don’t really come in this color – but I’m a blue girl. When I’m not wearing black or brown, that is. And this item should fit right into my wardrobe. The Thrifty Knitter’s Woodland Shawl pattern is beautiful in a handpainted or softly variegated drapey yarn. 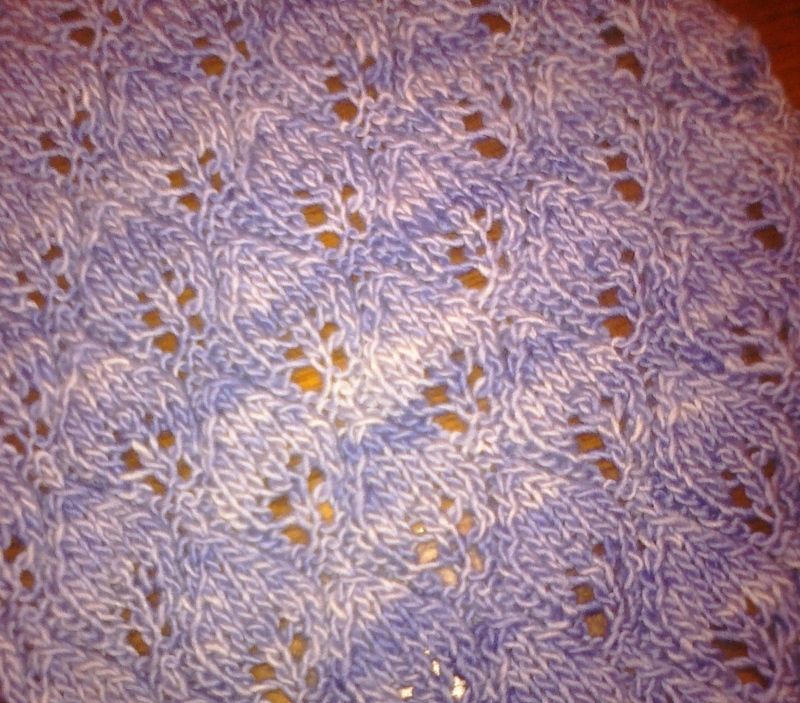 For a lace pattern, it is very easy to follow – once it is set up, the stitches hint at the flow of the pattern and what should come next. And it goes so fast that I can queue up a documentary or movie I’ve watched a dozen times and zip through one of the 16-row repeats in an hour or two. I would definitely recommend it for someone new to lace, and even to an experienced knitter who wants an easy pattern that is still interesting. I like that this pattern is rectangular, adjustable (length and width), and lacks the pointy scallops that seem to show up in all the shawl patterns lately. I really don’t care to painstakingly block and pull out all those little points. Not like that kind of frill is really my personality anyway. So this one scores major points. 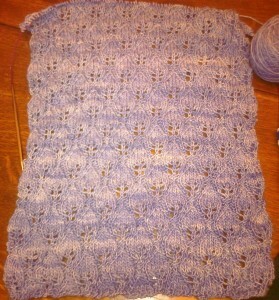 I’m making it up in the original width and will go longer, which means that I can wear it as a scarf with everything. I fell in love with the Blue Gingham colorway of this Madeline Tosh Merino – though I can’t seem to find it on the site. (Maybe that’s because it’s so new?) 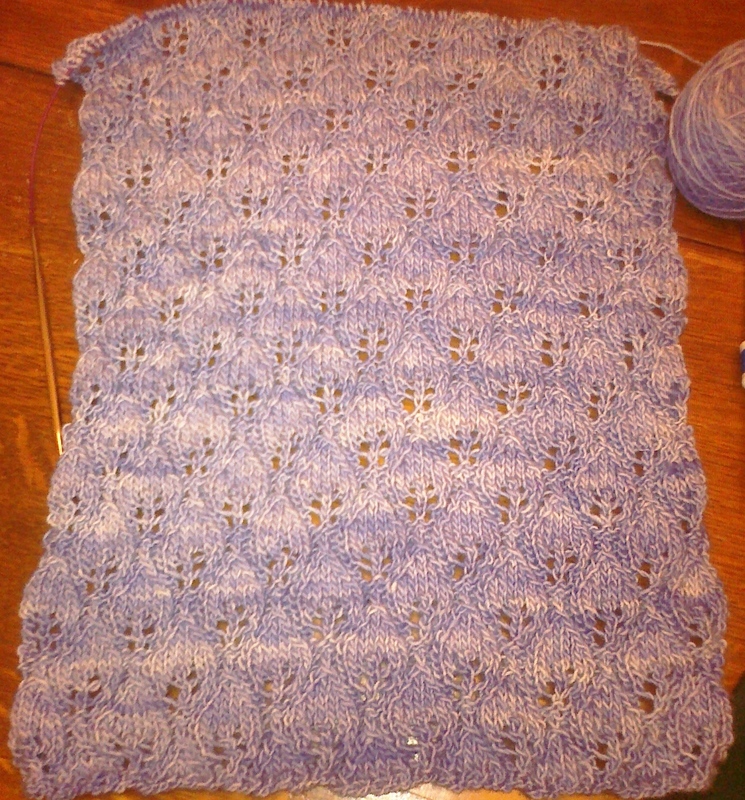 It’s turning out to be a good choice for this pattern; just the right kind of drape and so soft to the touch. The weather is beginning to feel very fall-like now and I see signs that the trees are ready to turn their leaves. I hope I finish in time to wear it soon! 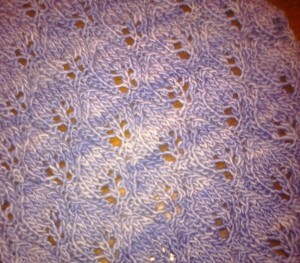 This entry was posted in Knitting and tagged blue, knitting, scarf, shawl, wool. Bookmark the permalink.